And once again we have feats that aren't worth taking. Sacred Weapon - If you are within range of the enemy (and you should be) this will proc your Sacred Shield feat, increasing your threat and provide Stamina Regeneration with each attack, also adds additional radiant damage to most attacks. If you are not close enough to the enemy, the Sacred Shield feat will not increase your threat. You can see this happen in the video above when the Red Iron Golem approaches and I use Sacred Weapon. The little bar above my character name is my threat indicator, and you can see nothing happens until I use Radiant Strike to close the gap. 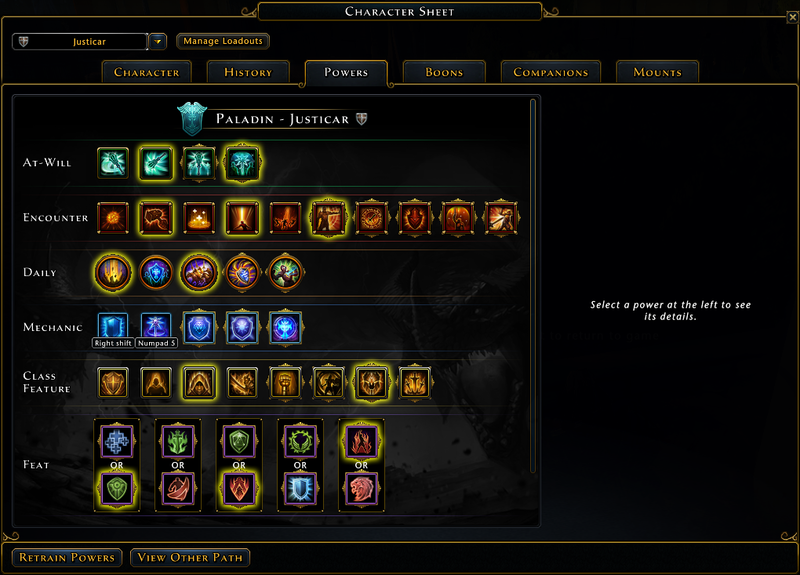 Radiant Strike - Close the gap with the enemy, dealing radiant damage to the target and nearby enemies. Templar's Wrath - Deal radiant damage to nearby enemies. 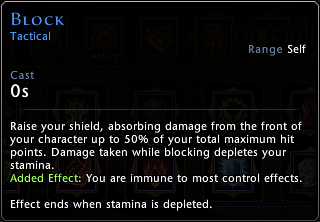 This should proc your Divine Pursuit feat, causing your At-Wills to restore divinity. Shielding Strike - Fill in with this At-Will. While using this you'll be restoring Divinity and Stamina because of the Sacred Shield and Divine Pursuit feats. Smite - Use this as the final attack in your rotation. Trash mobs, this should be a killer, tougher, single targets, this will place you at the top of your target's threat list and deal a decent amount of damage. This also chews up divinity, so use it wisely. Use Block and your dailies as necessary, Divine Judgement for single targets and Radiant Charge for multiple targets. While you are being attacked, using Block will help to restore Divinity. 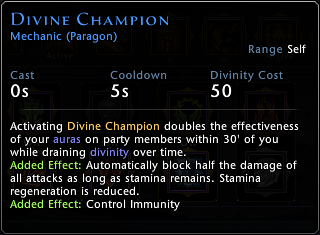 If you are taking more damage than Block can handle, and you have the Divinity and Stamina to spare, use Divine Champion along with Block which becomes Divine Palisade decreasing damage and healing you and allies behind you.